A day past the 40th anniversary we played the last round in my current game. The good doctor Boris is doing a larger loop around the Trojan Reach before returning (possibly) to Glisten, and our young Scout, accompanied by Li as his engineer, is returning to Cyan to get his ship fixed as well as report on what happened. I pretty much soft pedaled the adventure - originally I was thinking the Katydid would not be able to even launch, thus fixing the issue with 2 players and having 2 ships. However, as things worked out with real life, the plan changed a bit. 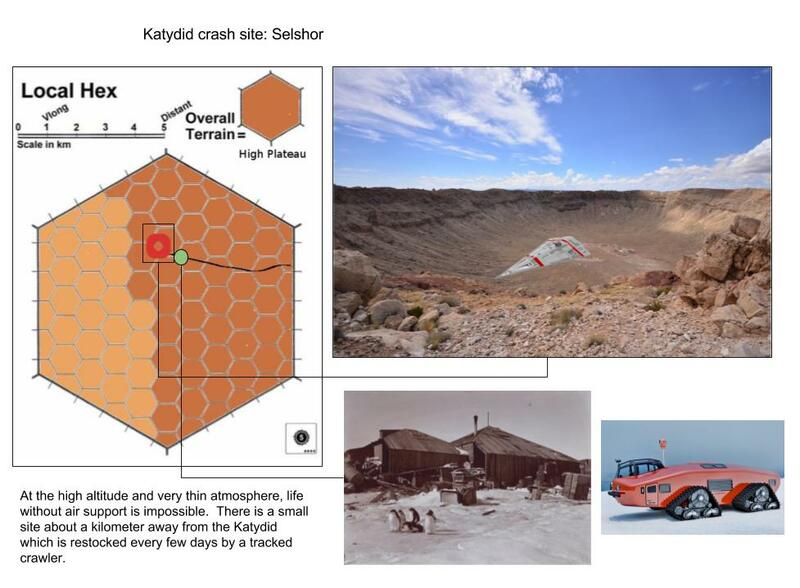 The Katydid was downed by an EMP, creating an impact crater on Selshor. The planet having a very thin atmosphere meant that the ship was almost safe from the local TL 6 governments. Between the high altitude requiring extensive equipment to live, and an almost impervious crystaliron hull, the ship, while scuffed and marked with repeated attempts to enter, was still safe and sound. The first trip was a scouting trip to see how bad things were. Using a probe to create ECM, the ship's pinnace landed nearby and Travis, Francine and Ferdinando got into the ship. They had a few minutes before the local government forces arrived from their base camp a couple of kilometers away. They managed to get the ships logs and do a quick engineering survey and found that the ship was damaged but that they could probably repair it. Another day in orbit, and Travis, Ferdinando and Boris return to the ship. They get enough fuel to get the Katydid to orbit, and start on the repairs. The local goons show up, waving submachine guns, but they are unable to get in or do any damage to the ship. Additionally, the local forces only have a couple of hours of air before having to return to the base camp. It takes another full day to repair the Katydid enough to get her into orbit, along with the daily display of impotent machismo from the local government. Finally everything is as ready as they can make it. Travis starts up the engines, and they sputter. Assuming a fusion plant can sputter....In the meantime, Le Suroit mentions that another crawler has just reached the plateau, hauling what appears to be a howitzer of some sort. As the terrain is unforgiving, and the crawlers are slow, they do have some time. 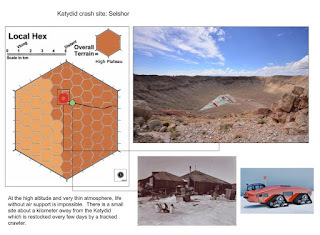 Which they needed - it was the third attempt that finally got the Katydid launched, and moments later they matched high orbits with Le Suroit. A few days of additional repairs, and the two ships parted ways, and we pretty much finished the mini campaign.